3 Must Read News Stories about Cloud Computing and Why they are Important? When we talk about cloud computing, we are essentially talking about a market that will be worth more than $100 billion next year. This figure tells us one very important thing – cloud computing and all technologies interlinked with the cloud are the future and they aren’t going away anytime soon. If you are following the cloud industry, you will know there is something new happening all the time. It is one of the most dynamic industries right now and also the most promising. Cloud technologists are constantly trying to push the envelope with respect to the applicability of the cloud, which means cloud technologies are evolving rapidly. At Agiliron, we offer a SaaS based commerce solution and our offerings are tied in very closely with the overall development of cloud computing. We keep an eagle eye out on all that is happening in this field; this ensures we are able to optimally leverage the phenomenal growth of cloud computing for client benefit. Back in May, Synergy Research came out with a report that showed Microsoft was fast becoming the cloud services company to beat when it came to market share. It was pulling ahead of its competitors and challenging Amazon. 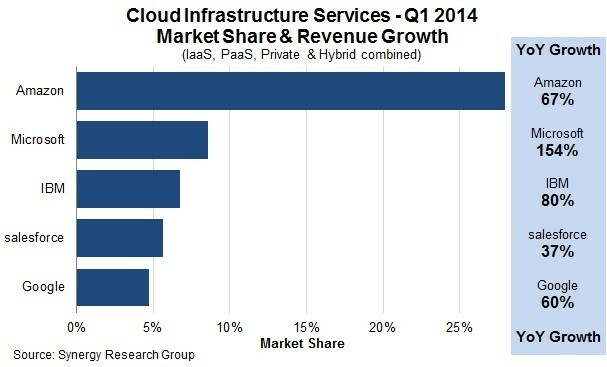 It looks like Microsoft will soon overtake Amazon to establish itself as the #1 cloud services provider. But, wait. You can’t expect Amazon to give up its market leadership position without a fight, can you? The tech giant has just launched AWS Directory Services, to strengthen its hybrid cloud services. With the launch of these services, Amazon is challenging Microsoft Azure, albeit indirectly. There are plenty of functional similarities between AWS Directory Services and Azure’s Active Directory. So, what does this mean for consumers? This is definitely good news for businesses and enterprise IT professionals. Competition is heating up, which means they can expect both Microsoft and Amazon to add on to their services portfolio as they will want their cloud services to be seen as a comprehensive IT-as-a-Service shop. Just when you thought you might have seen a semblance of sanity restored in the price wars being fought by big ticket cloud players, you find Microsoft upping the ante. It has announced unlimited cloud storage to Office 365 subscribers. However, this doesn’t come for free as consumers will have to shell out between $70 and $100 for a five-person home subscription. This offer shouldn’t be seen purely from the context of the price wars being fought by cloud services providers. The battle for increasing market share won’t be won by cutting prices alone. It will be won on the brunt of the quality of services and the features offered. So why are these companies slashing prices left right and center? The reason is fairly easy to identify. The idea behind the ‘price wars’ is to lock in as many customers into their ecosystem. Their objective is to keep increasing their memberships and when the time is right, they will stop fighting the battle on the price front. So what does this mean for the consumers? Should or should shouldn’t you take advantage of these “attractive” price discounts? Of course you should, but make sure you work with cloud providers who are offering the services/features you need. Focus on the features first and then the price. Work with a company you can comfortably do business with for a long period of time. Cloud technology is evolving at the rate of knots and as we mentioned earlier, there are businesses out there that are pushing the envelope; one such company is Bracket Computing. This startup has unveiled an infrastructure-as-a-service called Bracket Computing Cell. It’s giving enterprise consumers the power to virtualize the cloud. Yes, virtualized servers, storage and networks are passé, you can now virtualize the cloud; this essentially means the boundaries between private and public clouds become invisible and more seamless than ever before. So, what does this mean for the consumers? It will help you use the public cloud safely, reliably and with more predictably. The Computing Cell helps isolate data, applications and other IT assets and essentially acts as your very own virtual data center and looks and functions like your own private data center. You could then move your computing workloads across different cloud providers as you see fit. This way you experience the best of both worlds. At one end, you are getting the enterprise level security and performance associated with physical data centers and at the other, you can leverage elasticity, scope and scale of the public cloud. These three news stories are important in their own ways. They also give you an indication of the level of competition in the cloud computing industry. There is very little doubt that cloud technology is the most disruptive technology ever and how you use this technology will determine whether your business is able to survive and prosper or falls by the wayside. If you want to use cloud computing to grow your business it is imperative that you know what is happening in the industry and how you can leverage these ‘happenings’ to benefit your business and improve its products and services.